The percentage ranges, letter grades, and quality point values associated with the district’s former grading scale have depicted AGASD students as lower achievers than students from districts using the 9 or 10 point scales—even when the earned percentages were exactly the same.As is illustrated below, a student who earned a 92% in History; an 82% in English; and, a 90% in Geometry would be awarded a vastly different GPA depending on the scale used by the district he/she attended. Of 50 randomly selected districts from Allegheny, Fayette, Washington, and Westmoreland counties 42 use the 10 point scale or a modified version of it. This widespread shift to the 10 point scale has changed the standard by which performance is classified. Students’ GPAs are often used as a primary indicator of quality on college, scholarship, and employment applications. 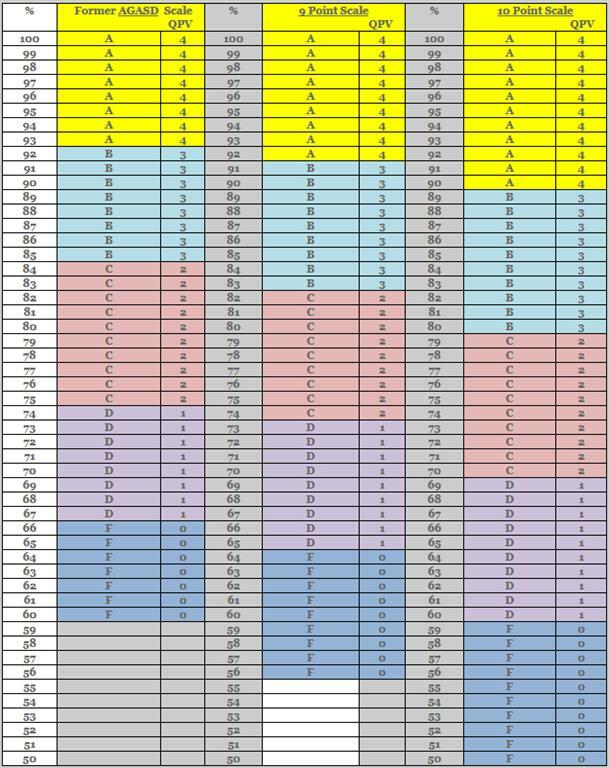 In order to give our students a level playing field, the Albert Gallatin Area School District has instituted a new grading system effective with the start of the 2011-12 school year. Figure 1 shows the differences between AGASD’s former scale and pure 9- and 10-point grading scales. 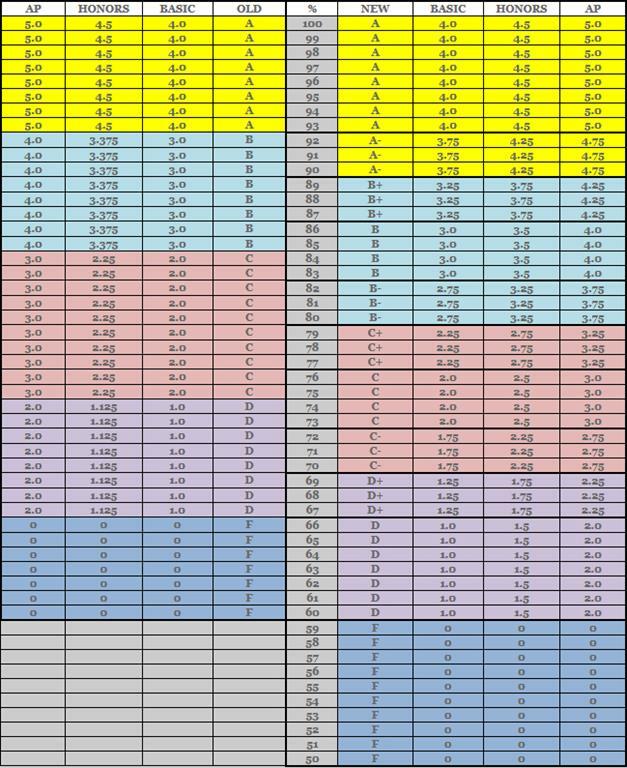 The district recognizes the necessity of moving to a 10-point scale; however, one of our priorities is to ensure that differences in performance are apparent within each letter grade. For this reason, AGASD’s new scale features +/- levels within letter grade ranges. Another priority of ours is to ensure that quality points are awarded equitably; thus, the new system embeds leveled quality point values within letter grade ranges—across basic, honors, and advanced placement classes. In other words, the student who earns a high “B” will receive more quality points than the student who performs in the low “B” range. The former scale made no such adjustments. Under the old system, the quality point value for a “B” grade in a basic course was 3, whether the student earned a high, middle, or low “B.” Similarly, a “B” grade was worth 3.375 in an honors course and 4.0 in an AP course, regardless of the percentage earned. The discrepancies illustrated in Figure 2 are based on scales that do not acknowledge different levels of performance within letter grades. The same student’s GPA under the district’s new system would be a 3.42, as illustrated in Figure 3. “Rigor of education” and “assessment of performance” are two vastly different things. The new grading system does nothing to manipulate the rigor of courses. It merely adjusts for the “norm” by which performance is classified and students are compared in contemporary educational systems. 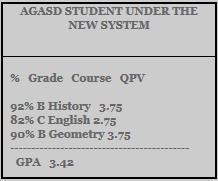 The letter grades, percentage ranges and leveled QPA equivalents associated with the new system are listed below. All grades earned under the former scale will remain. Grades for courses taken beginning with the 2011-12 school year will be calculated using the new grading system.